Earlier this year, I had Dr. Cow Aged Cashew Cheese for the first time. I'm not much of a hard cheese connoisseur, but I was seriously blown away! The Aged Cashew Cheese is so delicious, I knew I had to buy some more so I could blog about it. To up the ante, I also purchased some Dr. Cow Macadamia Nut Cheese to compare. 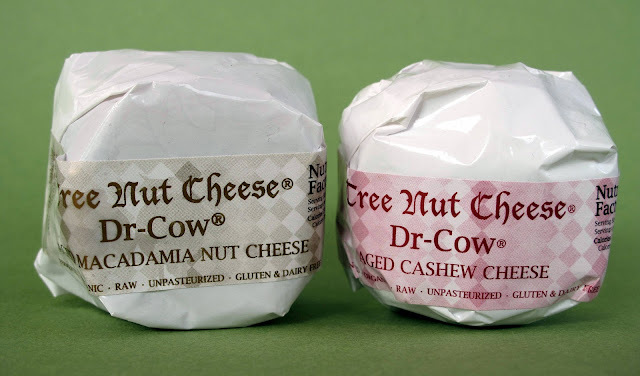 Dr. Cow promotes their cheese as Tree Nut Cheese, which is a cute way of saying it's Vegan without scaring off non-Vegans. Dr. Cow Tree Nut Cheese is also organic, raw, unpasteurized and gluten-free. 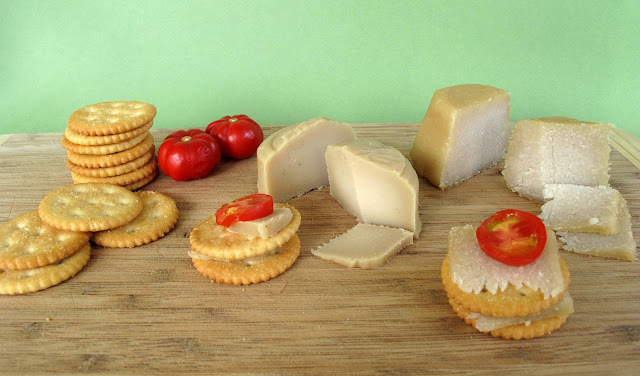 I could probably eat the cheese by itself very easily, but I decided to pair it with some Late July Classic Rich Crackers. Classic Rich Crackers are very buttery, just like Ritz. 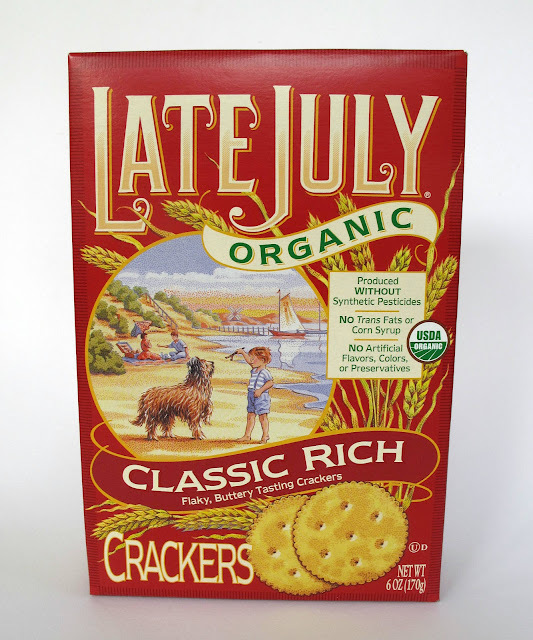 A great organic cracker that I find myself buying all the time. The Aged Cashew Cheese has some salty ranch notes. I can taste the cashew flavor, but it's so refined, you might not notice. Comparing it to real cheese, I would say it has a smoked Swiss flavor. I'm in love with Aged Cashew and will go on the record as saying it's (presently) my favorite cheese. Aged Macadamia Cheese has some fruity notes. I got a strong macadaminan flavor. Very tangy and a little mustardy. I found it a little softer than the Cashew Cheese, which isn't a bad thing. So if you love hard cheese or cracker cheese, I think you'll really enjoy Dr. Cow. I can recommend the Cashew and Macadamia for sure, and I hope to try the other varieties soon! If you can't find it in your area, Vegan Essentials is having a 10% off sale for the entire month of October, using coupon code "mofo!" Dig their packaging. I like smokey cheez, so I'll have to give this a whirl. I can't believe I haven't tried this stuff yet, I need to find some next time I'm in the US. Thanks! Yeah, the Aged Cashew is an excellent choice. i still eat real cheese, but I love trying vegan foods, this look really great, i might have to try it! Oh man I love love love Dr. Cow. I ordered a half case of it for my birthday this past year and it lasted several months. I treated that stuff like gold. Lagusta used to sell it, but now she's renting kitchen space to the Treeline Cheese folks. I haven't had Treeline yet - let me know if you have. I want to order it so bad! John, definitely try one of the green varieties: kale or blue-green algae; they'll blow you away! I splurge once a year and have a buffet all my very own. I want to buy this every time I see it, and then I never do cause it's so expensive! Some day I will eat all the Dr. Cow.